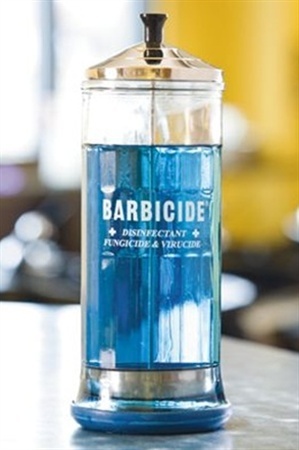 Barbicide traces its origins back to 1947 New York, where a science teacher named Maurice King first concocted the disinfectant solution that would come to represent crystal blue clean in salon circles for more than half a century. Maurice was determined to set a higher standard for cleanliness, and his breakthrough formula-distributed in transparent stainless steel and glass jars would eliminate germs and fungus from combs, razors and other tools of the trade. While other brands of disinfectants tend to fade, the brilliant blue Barbicide always kept its color over time. Savvy barbers used this fact to their advantage, suspending combs in the stylish, blue liquid for customers to see. A recognized symbol of superior salon hygiene, Barbicide® is featured in the permanent collection of the National Museum of American History at the Smithsonian.